Main Street Flushing is a delicious place. The cleaniness and charm of Brooklyn, mixed with the business of Manhattan's Chinatown. That is what Flushing is like to me. Every block you walk, there is at least one Taiwanese "sui sik" or "small meal" shop, serving up a large variety of Taiwanese-styled snacks. Steamed buns can be found anywhere, and the smell of frying dumplings and deep-fried scallion pancakes fill the streets. Inside a food center is a man skillfully making pulled noodles with just his hands and a pizza cutter. People watch as they order their bowlful of noodles, knowing that they're getting them fresh. Yesterday, I spent the day on Main St. Flushing. The area around the East Buffet (dim sum=bleh, fresh fried stuff=mmm. buffet=yum!). The area is crowded with Chinese shops and small establishments selling a huge variety of food. The Golden Mountain Food Market nearby is basically a warehouse of chinese foods, from dried udon noodles (I got a 3lb. package) to sausage, hanging by ropes. Tomorrow is the Mid-Autumn festival, which I called Mooncake Day as a child - and still do today. All the bakeries are selling obscene amounts of the paste-filled pastries. Personally, I love mooncakes. Once a year, I get to gorge myself on these delecatble calorie-bombs, made with lard and filled with sweet goodness. To tell the truth, I grew up on the packages tins from Hong Kong, and never knew about the bakeries that made them fresh with love. So much effort goes into making these by hand, and molding them that it's worth the prices. My mom and I visited the Yi Mei Bakery which was selling ONLY mooncakes. They had so many type to choose from, and two shapes - traditional and the newer, caramel-colored ones. The mini-mooncakes were so cute and perfect for single-servings that I had to keep berating myself for wanting to buy a box. After sampling two flavors (more on that tomorrow - the big day), we walked around a bit and bought some steamed meat buns from a vendor that resembled a food stall - except spanning half the block. Afterwards, we met up with my father and some friends who were eating at East buffet. We went to check out mini-vans with our friends, then visited some more friends in Greatneck(?). We came back and basically bought our dinner from East buffet - precooked soong for 3.25 a container. My sister and I had clay pot rice with lots of lap yook. A delicious end to a delicious day. Posted at 6:41 PM in Lunch. 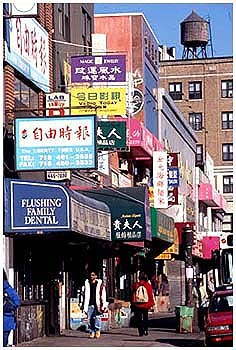 I didn't know there were that many Chinese in Flushing now. I used to live on Cherry Avenue about 7 or so blocks from the 7 (I think that was the number) train station back in '87. In those days, there were lots of Koreans and Indians there. On my block (Cherry and Main), there was a nice Korean restaurant on the corner and a Korean grocery store across the street from the restaurant. I think the Chinese starting going to Flushing around the mid-90's. There are still a lot of Koreans and Indians leaving in the area as well. I don't recall seeing any Korean restaurant or supermarket on Cherry St. though.